Have you ever been out for a lazy sail and wished you could step below for moment to grab a cold drink or perhaps a pair of sunglasses but you couldn't leave the tiller unattended? Davis Marine makes a product they call a "Tiller Tamer" that might help in such a situation. The Tiller Tamer is essentially a clamping device for a tiller control line. It is constructed of durable, hard plastic with stainless steel hardware (screw/hex nut). The Tiller Tamer mounts directly on top of the forward end of the tiller handle. If your tiller is made of anything other than wood, you may need to fabricate mounting hardware or forego the Tiller Tamer all together. The device is mounted via two wood screws. The control line (1/4" diameter provided) is then run from the stern corners of the cockpit to the Tiller Tamer. 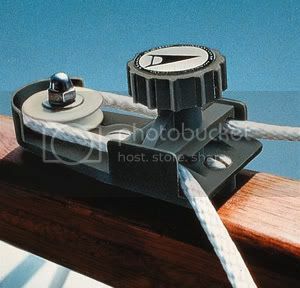 I personally used jam cleats mounted directly in the fiberglass of the cockpit's stern to anchor the control line. You could also use cam cleats or other means. The Tiller Tamer does NOT come with any cleats. The device works by turning the knob on top of the Tiller Tamer to essentially clamp the control line and thereby hold the tiller in a set position. I've found the clamp to hold very well in most conditions. Davis Marine advertises that the device works in "any weather or wind condition", but I wouldn't trust it in anything more than moderate wind and waves. I also would not recommend leaving the cockpit or tiller completely unattended while the Tiller Tamer is in use. Depending on how well your boat tracks, you may find that even with the Tiller Tamer in use the boat will wander and move off course in a matter of minutes. Small adjustments and a watchful eye make the Tiller Tamer more effective. If you're looking for a simple and affordable way to occasionally free up your hands while in the cockpit, the Tiller Tamer should do the trick. However, I do not recommend it as a method of true self-steering. The Tiller Tamer can be purchased from many vendors from between $25 and $35, plus the cost of cleats.